Portable multiplane balancer Balanset-4 (2466 EUR). Shipping: International Shipping: TNT express, EMS Post. International items may be subject to customs processing and additional charges. 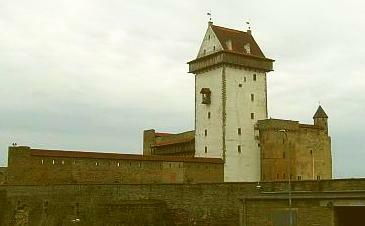 Item location: Narva, Estonia. Ships to: Worldwide. Seller ships within 10 days after receiving cleared payment. Returns:14 day returns. Buyer pays for return shipping. Balanset-4 is 4-channels portable balancer used to balance rigid rotors in their own bearings (in-situ) or as measuring system in the balancing machines. It provides (1..4)-plane dynamic balancing services for fans, grinding wheels, spindles, crushers, pumps and other rotating machinery. 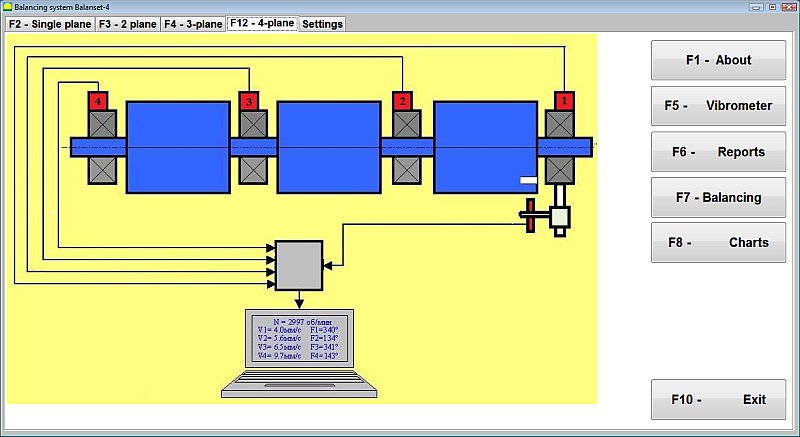 Balancing software provides the correct balancing solution for (1..4)-plane balancing automatically. Balanset-4 is simple to use for non-vibration experts. 4x vibration sensors based on Analog Devices ADXL series. 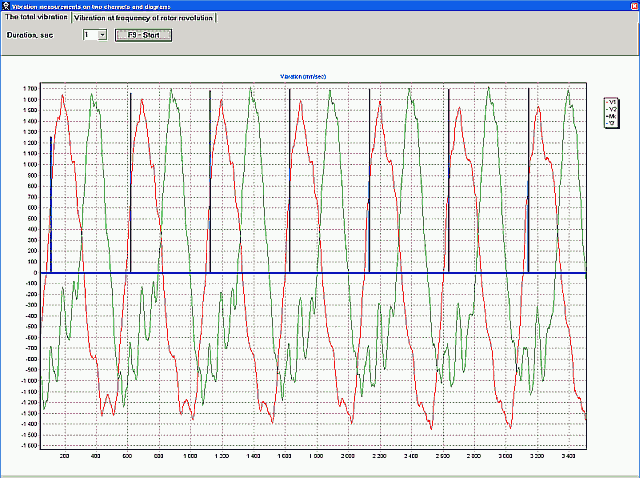 Software provides measuring vibration, phase angle, calculation of value and angle of the correcting mass. 2. Prepare to work. 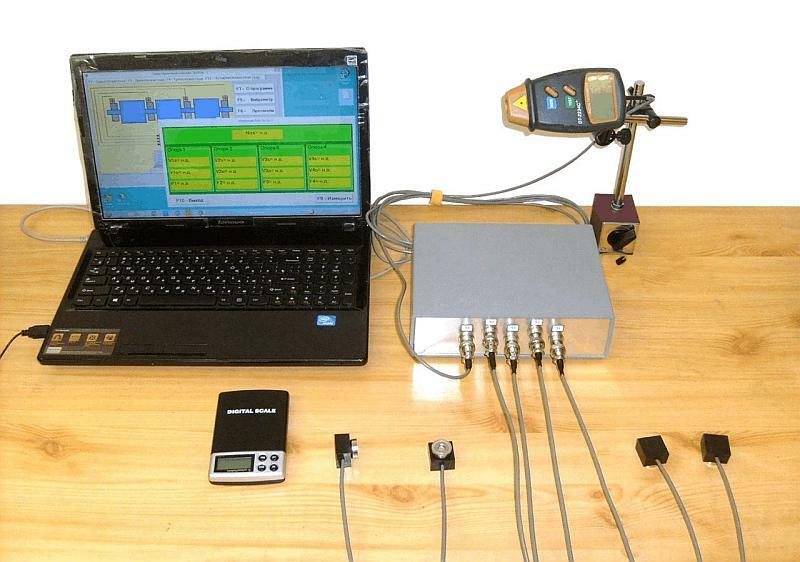 Software and hardware setup for multiplane balancing. Install drivers and Balanset-4 software from installation flash disk. Insert USB cable to computer USB port. Interface module power supplied from USB port. Use shortcut to run the program. Install reflector mark on the rotor and check RPM value on the phase sensor when the rotor rotates. Run 0 - Start-up without test weight. 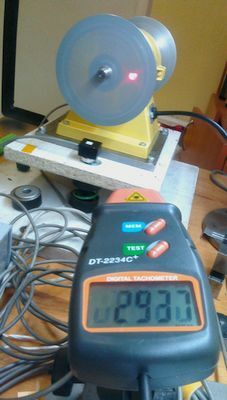 Click on F9-Start and measure the vibration level and phase angle in turn without test weight. Duration of the measuring process may amounts 2-10 sec. Mount a trial weight of suitable size in plane 1(2,3,4). 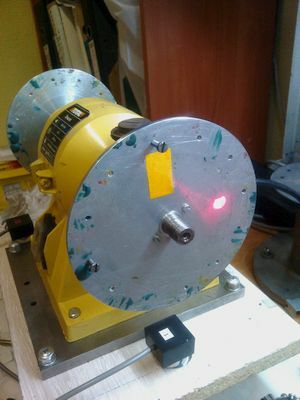 Start the machine again, click on F9-Runand measure the vibration level and phase angle once more. 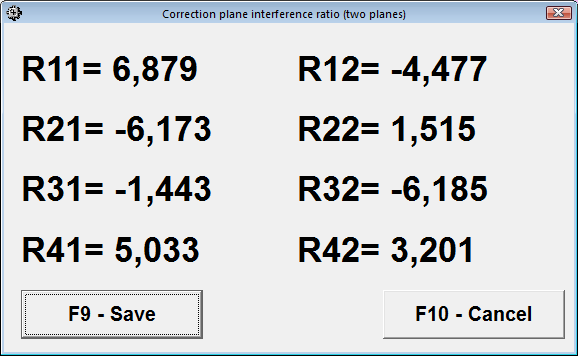 The values of the correction weights and angles required will be calculated automatically and shown in popup form. 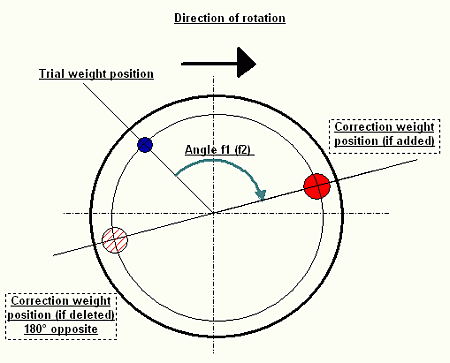 Mount the correction (balance) weights at the positions indicated in popup form at the same radius as the test (trial) weights (as shown in the figure in right column). Start up the machine again and measure the amount of residual unbalance in the rotor, to see how successful the balancing job has been. To start the measuring process click "F9-Run"
If you save the results of previous balance runs, you can eliminate the test weight run and balance the machine using its saved coefficients. Select "Secondary" in the "Type of balancing" window and click "F2 Select" button to choose previous machine type from list. To save coefficients after balancing click "F8-coefficients" in the balancing result pop-up window (see Tab.1) and then click "F9-Save" button. 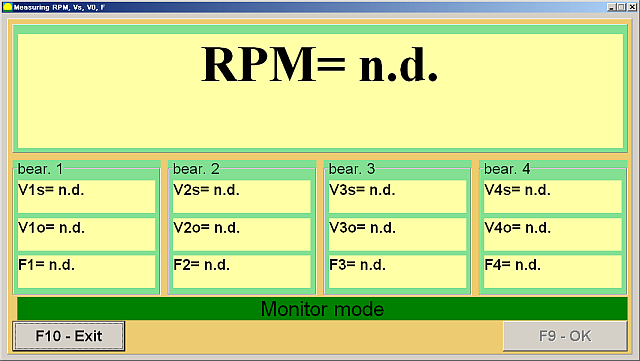 Input machine type ("Name") and other information in the table. 4.3 Rotor balancing frchives and reports. To save balancing information click "F9- Add to archive" in the balancing result pop-up window (see Tab.1). Input machine type ("Name") and other information in the table. To open previous saved archives click "F6-Report" in the main window. 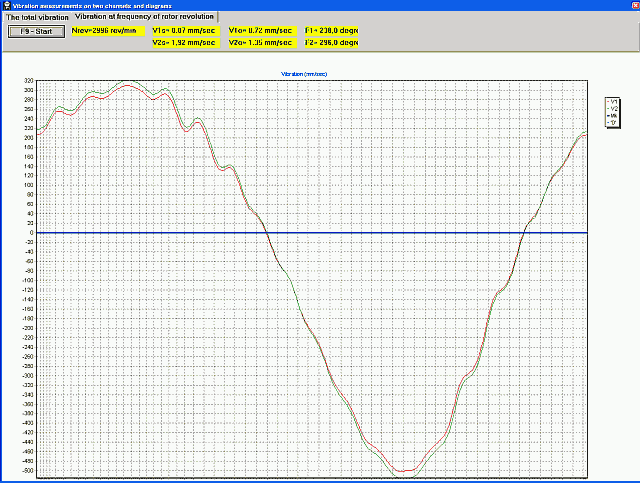 To print report click "F9-Report"
To view charts of vibration click on "F8-Diagrams"